The Genesis 54 is more than a swimming pool… it is emotion… it is pride in your home… it is fun with style. When it is hot outside, nothing beats wading in the cool waters of your above ground pool. The Resin Series brings you innovative technology and incredible endurance that will win your heart as the ideal fusion of high technology and impeccable style. Resin injection molding is a revolutionary process that eliminates corrosion risks and guarantees long- term dependability. Transform your backyard into an everyday vacation. Genesis 54Outback® knows the backyard is becoming the focus of summer entertainment. 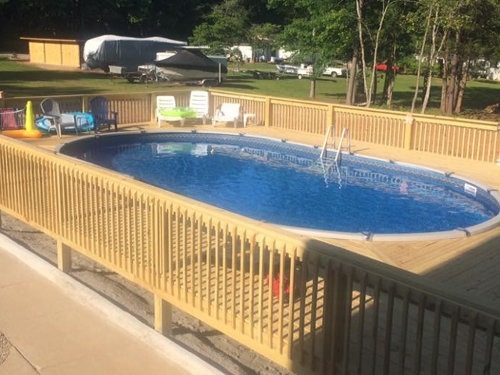 The Genesis 54 combines the features of injection molded resin with design elements never seen before in an affordable backyard swimming pool. The Genesis 54 pool comes standard with a Wide-Mouth skimmer system for superior skimming action and a cleaner pool. The Outback Genesis 54 by far is the better choice.